In January, I traveled to Seattle for four days of training as an inaugural member of Citizen University’s Civic Seminary. 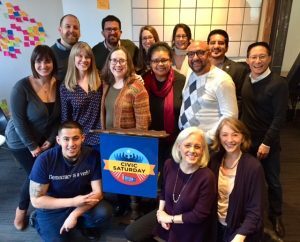 The program brought together eleven civic leaders from across the country to learn the traditions of American civic religion and prepare to create Civic Saturday programs in our own communities. At the culmination of the program, each of us was tasked with writing and delivering a five minute civic sermon. I began my speech by inviting everyone to stand up and yell at the top of their lungs for seven seconds. I explained that we were going to create a collective metaphor, and that on my cue, they should begin shouting a list of all the issues that they care deeply about. As I’d hoped, the result was seven seconds of unintelligible, deafening noise. I could see everyone’s mouths moving, but it proved impossible to untangle the voices to follow any single thread of meaning. I lowered my arms like a conductor, and the room fell silent again. Beautiful! Please be seated. I love all the passion. Clearly, this is a room full of people with strong feelings. The problem is, I can’t even begin to sum up what we feel strongly about. In seven seconds, we created a pretty spot-on metaphor for the current state of American political dialogue. Because that’s what it feels like — our country is a room full of capable, passionate people, all yelling together about different things. A room where everyone is too busy speaking to listen to what their neighbors are saying. There’s something red-blooded American about a shouting match of ideas. Of all the freedoms outlined in the bill of rights, freedom of speech is uniquely foundational. Ben Franklin recognized this, and he warned: “Whoever would overthrow the liberty of a nation must begin by subduing the freeness of speech.” It is a freedom we never stop grappling with. A tool of the disenfranchised who spend generation after generation calling and organizing for justice, and a tool of the extremists seeking space to foment bigotry and violence. At a time when we have good reason to fear for the health of our democratic institutions, we must focus our energies on what Franklin identified as our first line of defense. We must ask, what can we do to preserve our freedom of speech? And then we must think beyond mere preservation and ask, what can we do to cultivate and nurture our freedom of speech? And how can we each practice that in our everyday lives? Big questions, but I believe there are simple answers: we need to build our confidence to speak up and our compassion to listen. Freedom of speech only matters if people recognize the power of their voices. It is an act of courage to share your story with the world. When I was a counselor and advocate for victims of domestic violence, I saw firsthand the suffering people will endure when they feel incapable of speaking up. I worked with clients who refused to go to the police, even when their bodies were purpled with bruises, because they worried that maybe they were making a fuss over nothing. Imagine that individual uncertainty spread across a community: how chilling would our metaphor have been if, invited to shout our beliefs, we all stood in silence for seven long seconds? People don’t just wake up voiceless one day — it’s the symptom of a slow erosion of self. When we catch ourselves slipping into needless doubt, we must remind ourselves of the value of our own perspectives. When we challenge an idea we disagree with, we must also express respect for the human being who’s taken a risk in speaking their mind. Freedom of speech without a belief in voice means silence, and it is our daily responsibility to practice affirmations that build our confidence to speak up. As much as freedom of speech relies on that courage, it carries a deeper obligation for us to listen to the speech of others. That shouting match metaphor will continue to represent our first amendment if we don’t think more deeply about why this freedom is fundamental. Speech without listening is noise. Right now, we are all so desperate to feel heard that we have developed a common refusal to hear. I worked in a middle school (another metaphor for the noisy, often hormonal state of American political discourse), and this feeling of resistance was commonplace — I’m not gonna listen to him if he’s not gonna listen to me! The more we feel misunderstood, the more loudly we try to make our point. Yet we can learn to recognize and overcome this impulse to speak first. Doing so, we realize that listening to others often makes others more willing to listen to us in return. It is an act of grace that allows us to recognize our shared humanity, an act of grace when we remind ourselves that we all driven by the same, very human feelings. We can validate someone’s feelings, even while disagreeing with their ideas: It sounds like you’re upset. It sounds like you’re angry. It sounds like you’re not feeling heard. Sometimes, just naming the emotions you hear can create common ground between people, even when our policy platforms will never come close to aligning. That small act of validation can be enough to quiet the cacophony, so that we can begin to pick out the melodies and dissonances. I hope that the next time you hear something you disagree with, you have the courage to open up a conversation with that person. And I hope that when someone brings a critique to you, that you have the compassion to set aside your justifications and deeply, attentively listen. Ultimately, the movement of this country will be determined by whether we can all take these small steps. More than the big political moments — marches, elections, bill signings — it’s the accrual of daily actions and interactions that will determine the nature of our liberty. These political times require us to move beyond silence and be fierce advocates for the issues we believe in. But they require, too, a commitment to move beyond noise. To aspire to do more than shout.